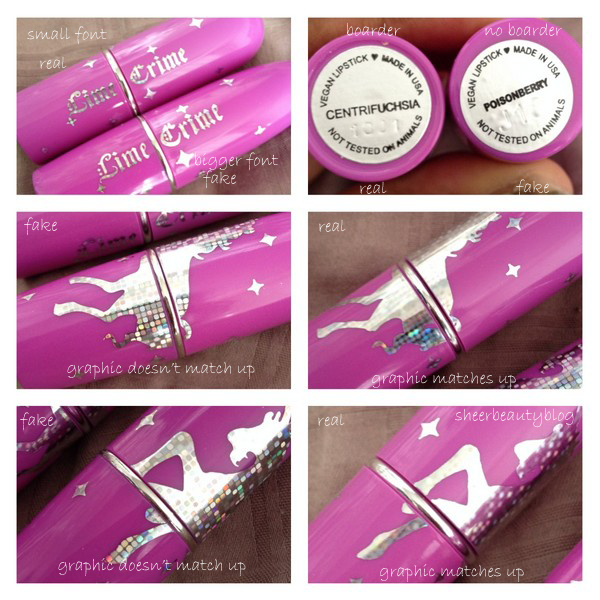 Today I have a review on another Lime Crime Lipstick as well as a little warring about fake Lime Crime lipsticks. 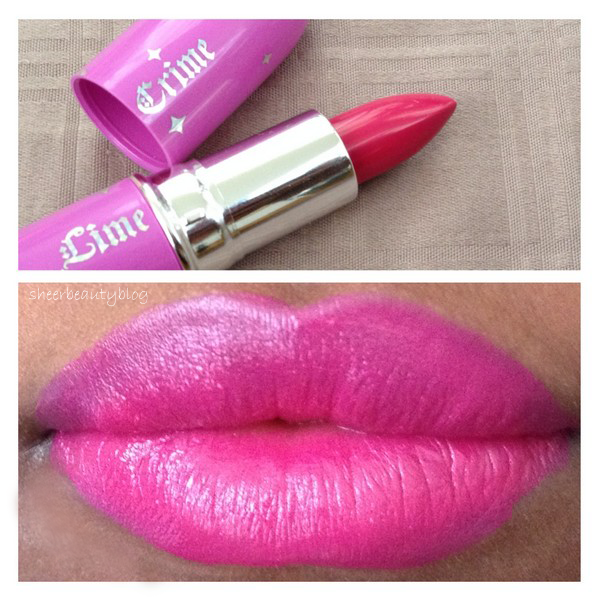 Lime Crime Opaque Lipstick in Centrifuschia is a bold pink lipstick the colour is bright and loaded with pigment. Centrifuschia is a fuchsia colour lipstick, this lipstick goes on nice and smooth. The texture of this lipstick I would have to say is creamy. I love the way this applies to my lips. This shade without eating or drinking last for a good amount of time before you may need to reapply. However it's not waterproof so you do need to touch up after eating or drinking. Overall I would rate this A+, I have two tone lips and this lipstick does a pretty great job at masking that. I think you can tell a bit that the lipstick does look a bit darker on my upper lip but it is not a big difference. Below is how to tell a fake Lime Crime Lipstick apart from a real Lime Crime Lipstick. I bought my first "Lime Crime" lipstick at Imats sold by a vendor that was not Lime Crime and then months later I bought one from there website. At first when I bought the fake lipstick I thought to myself this looks a bit different from the website and I thought it was fake but I push that thought aside because I believed only really popular brands like MAC have people making fake lipsticks of the brand. I was wrong and I have stopped using the fake lipstick since I learned it was fake from a instagram post I saw about fake Lime Crime lipsticks being made in China and being sold. Also note the fake lipstick is longer and slimmer then the real Lime Crime lipstick. I haven't heard much about fake Lime Crime...and it's crazy that you got it at IMATS and it ended up being fake!!! I've been trying to get my hands on some of their lipsticks for ages, but they're ALWAYS sold out! Yikes...at IMATS :T I would definitely raise this issue with IMATS in general, so they don't allow them back in the future. Such a shame. I would but I don't remember the name of the vendor. It kind of wired because I bought other stuff from them from house of lashes and that was not fake and they were selling brands like elf and bh cosmetics. 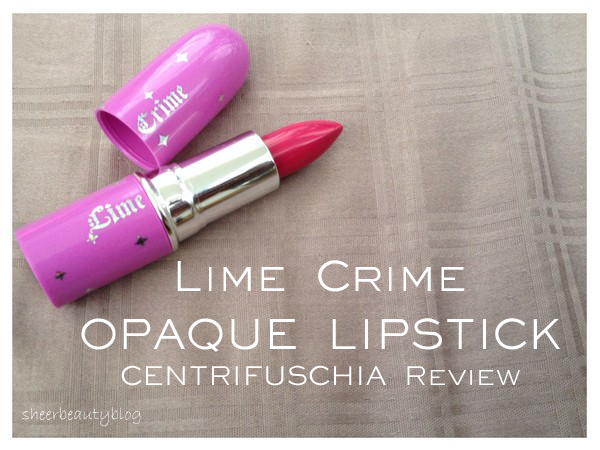 I still haven't tried Lime Crime, but this fuchsia lippie is beautiful! Thanks for sharing how to spot a fake; can't believe someone got away with selling them at IMATS. I know I can't believe it too. The color is so amazing I didn't know they sold fakes of these! That's insane. Thanks for the post I am living in Toronto and these aren't found on ground. So I will have to ship, and Im happy you took the time to share so I dont end up with a fake. Your welcome lime crime actually has a list of vendors so you can check that out I know there is one in Ontario but I'm not sure if they only sell there polish or there whole line, because I know that lime crime can't ship polishes to the Canada so they have a another site there customers can go to for there polishes. Pink is my favorite color so I think I’m going to love this.